Think about it. If you never planned a thing in your life, never had any goals or aspirations—never thought about your next move, you might find yourself in a constant state of improvisation. On the other hand, you can try to plan your life out to the last detail—but life has a way of working out in ways you could have never planned for. Why should creativity be any different? 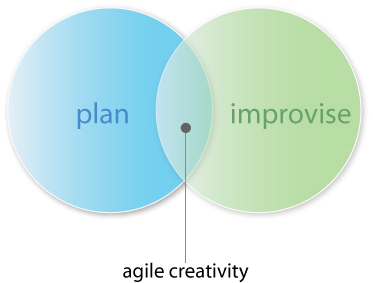 Agile Creativity is about planning for a variety of scenarios—anticipating and developing a strategy, but not being so rigid as to lose the capacity to improvise when things don't go as planned. In the overlap exists a state of agility, founded off a core set of guiding principals—yet flexible enough to adapt to changes in the creative ecosystem.